Sanctuary Spa at Sanctuary on Camelback Mountain Resort & Spa. Nestled within 53 acres with the stunning Camelback Mountains as its backdrop, Sanctuary at Camelback Mountain Resort & Spa in Scottsdale, Arizona, is a sight to behold. The award-winning luxury resort is uniquely embedded within the spectacular terrain, providing panoramic views and the ultimate feeling of escape. Guests of the resort can also embark on an Asian-inspired journey of rejuvenation at the resort’s recently remodeled Sanctuary Spa, which has unique and luxurious amenities that include a tranquil Zen garden and luxurious Watsu pool. The spa also offers an array of indulgent and relaxing services ranging from massages to acupuncture. Why You’ll Love It: There’s something to be said about Sanctuary, about Camelback Mountain, and about the people that work here. Guests are drawn to the spa’s peaceful and calming energy, and the very special guest experience we’re able to deliver due to our boutique size. Everything we do here is unique, from our treatment menu to the personalized service. Sanctuary is a great place to be. The spa lobby and reception. 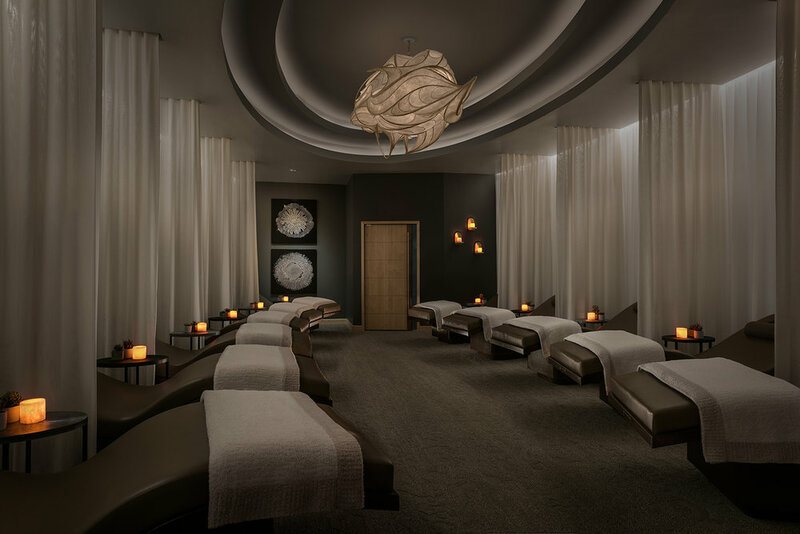 Key Features: At Sanctuary Spa, we seek to provide the ultimate wellness experience, and last Spring we unveiled a top-to-bottom spa refresh and expansion for our guests and spa members. The women’s spa areas have been expanded, featuring a brand-new Women’s Quiet Room and a steam room that’s twice the size of the original. The transition from the foyer to the locker room has been reconfigured for privacy, and seating in the lounge has been expanded. The showers and the jacuzzi have been revamped as well. The men’s spa space kept its original footprint with all new finishes and furnishings. Other facilities including the lounge, locker room, waiting area, and Jacuzzi have been refurbished with new floor-to-ceiling windows, textured walls, furnishings, and a new palette. Sanctuary Spa features 12 treatment rooms, a Watsu immersion pool, indoor Couples Suite, movement studio, fitness center, 25-yard outdoor lap pool, and boutique. Complementing the Sanctuary Spa is a unique guest enclave dedicated to complete wellness called Villa del Sol. It’s a welcome commune for retreats with a strong emphasis on the whole mind and whole body focus of the Spa. The 3,500 square-foot, four-bedroom Villa del Sol, coupled with four adjacent Terrace Casitas, accommodates groups of up to 16. Distinct spa-centric amenities are exclusive to Villa del Sol guests, including a treatment room for massages and a movement studio for private classes. Guests’ needs are attended to by a Spa Concierge and they enjoy the services of a dedicated Sensei in Residence. 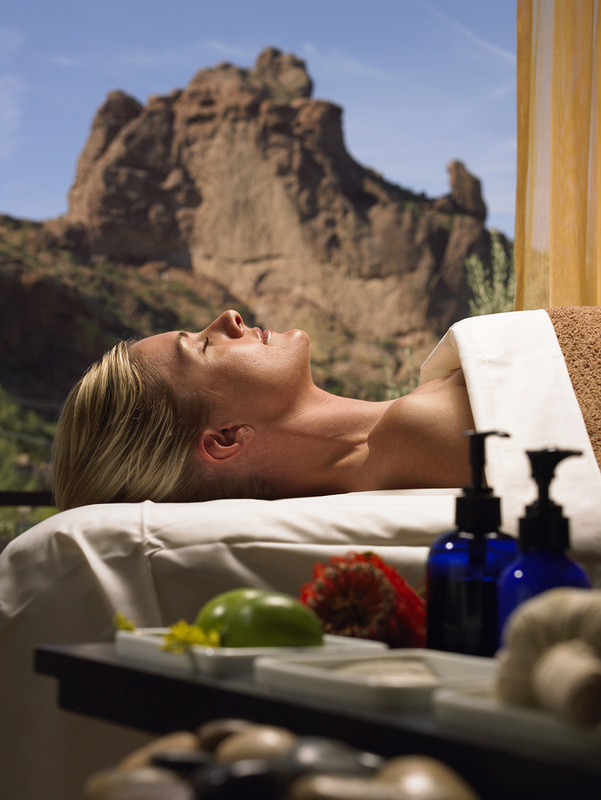 The resort and spa are beautifully embedded within the terrain of Camelback Mountains. Insider’s Tip: A massage in Sanctum, our private stone-walled outdoor treatment room, is a must. Bonus: Highly specialized services at Sanctuary Spa are reserved for Sensei therapists—a team of specially trained staff who take a multi-dimensional approach to body work. Each Sensei must pass rigorous certification, including oncology massage and restorative consultations, and bring with them no less than 10 years of experience. Spa-goers should feel confident and at ease with Sanctuary Spa’s therapists. Snacks Served: We offer dried cranberries and golden raisins, whole almonds, coffee, hot and iced teas, and citrus water. Unique Treatment: Tok Sen. In this treatment, the fluidity of Thai massage is blended with vibration therapy for a rare and unique experience. This healing treatment from Thailand uses a tapping technique (Tok) that evens the flow of energy along the meridians (Sen) that is both meditative and restorative. Splurge Treatment: Our Watsu aquatic experience takes place in Sanctuary’s private heated Watsu pool. This deeply relaxing, nurturing experience is a passive form of aquatic therapy that supports and gently cradles, rocks, and stretches your body in graceful movements through warm water. The support of the water provides relief from joint compression, and promotes enhanced range of motion for your spine and extremities. Insider’s Favorite: Our Luke Pra Kope treatment is unique to Sanctuary Spa and encompasses many levels of healing and wellness. Meaning "to massage with medicinal herbs," Luk Pra Kope begins with guests soaking their feet in a fresh lime and essential oil bath. After the feet are cooled and exfoliated with fine, white Thai clay and fresh lime, a blend of steamy, organically grown herbs is rolled, massaged, and pressed into tight muscles, onto problem areas and energy pathways. Along with Thai massage, the heated compress soothes sore, aching muscles, enhances circulation, reduces joint stiffness, and refreshes skin. The women’s showers and locker room. Featured Products: Naturopathica and Skin Authority.